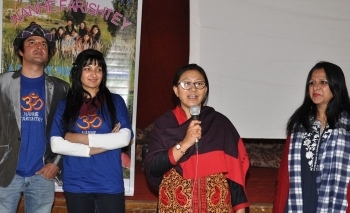 A children film titled ‘Nanhey Farishtey’ based on the social message of Beti Bachao, Beti Padhao, and Swachh Bharat Mission was screened on May 25 at Tribal hostel hall, Leh. The film is produced by Hare Rama Hare Krishna production house. A large number of spectators including students of Government Boys and Girls Higher Secondary Schools Leh, teachers and staff were present. Tashi Dolma, Joint Director inaugurated the screening of the film. She said, “Though girl education finds great importance here in Ladakh, the basic shy nature of our kids needs to be addressed at large”. Congratulating the team for working on a film that conveys such important messages, she expressed hope of screening the film in other government schools of the district too. Nixie Mahajan, Actor / Director of the film said that the film was screened at World Trade Centre, Mumbai and in various other parts of Jammu region. Makers of the film gave preference to the kids of the state for casting as well as child singers. Four songs in the film are based on social issues which again reflect their importance. Sharing her vast experience as actor and model in Mumbai, she said that Nexie felt to make a film and she chose her own state to debut as Director. Arjun Mahajan, Actor / Producer of the film said, “The 90 minutes film gives out the important message of letting kids choose their own career and to help them in recognizing their inner talent”. Talking about the further screening of the film, he said that the film will be shown in various schools of the district. He requested parents to not to pressurize kids in academics.